Since moving back to Los Angeles I have realized how much I have missed LA style architecture. In particular I have been seriously creeping on hacienda style homes! They are everywhere in my neighborhood and throughout Los Angeles, it brings me so much joy. 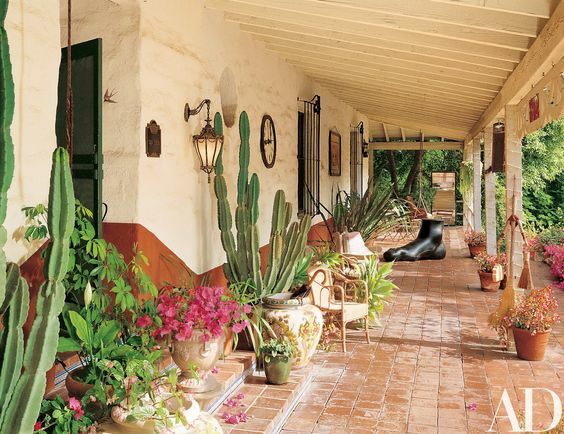 Hacienda style is what I call these gems, but this style is also known as "Spanish style" / "Mission style"/ "Spanish Colonial"/ "Mediterranean Style". Right now, after this winter's down pour of much needed rain, the landscaping normally associated with this style of architecture is popping!! The plants are so happy, so green and blossoming, looking incredible against the terra cotta or white washed exteriors. I love these exteriors for their organic textures, the patinas that grow with time and make it all the better, the feeling of ease when you see them. They look 'unplugged' from the modern hustle and bustle, they allow you to picture putting your feet up and relaxing. They are reminiscent of simpler times, whenever that was! They can be simple or they can be covered in abundance, they can be a calm quiet or they can exude playful humor. Any way- these haciendas are a breath of fresh air. IF you lucky enough to live in one of these incredible homes, yes, I probably inappropriately stare at your house but don't worry, I never take any pictures! Here are some of my favorites from pinterest. YUP!!... I feel like I've been on vacation just by looking at these!